The most impulsive thing Helene has ever been known to do is travel to Italy WITHOUT a preset itinerary or reservations other than the round trip flight. She does not have an iPod or iPad, and she uses her smartphone as just a telephone and to check the weather. She admits to failing miserably at Twitter and Facebook but says she can do FourSquare, sort of. NALS Past President Patti Infanti, PP, PLS, has spent many years on the NALS Board with Helene and says that she and Helene are simpatico. Both are detail-oriented, methodical worker bees who thoroughly enjoy working on projects from start to finish. She has seen first-hand Helene’s willingness to learn and embrace new technology, thoughts, and ideas. She has found a wonderful friend in Helene and believes NALS members will find Helene personable and approachable. Plus, Helene loves cats and gardening—like Patti said, simpatico! Helene was born in Wichita, Kansas, but got to Texas as fast as she could. She was two-and-a-half when her family moved from Wichita to Houston. A few years later, her parents bought their first home in Pasadena where Helene lived through her school years. One of the first dollars Helene earned was during a summer when she and her oldest sister washed windows at home. Ever the tomboy, Helene chose the outside windows to wash so she could go out on the second story roof to do the upstairs windows. After graduating from junior college, she moved into her own apartment and later met and married her White Knight. Although the marriage only lasted ten years, Helene still lives in the house they built in Crosby. One summer during high school, Helene worked as a soda jerk at a small pharmacy in Pasadena. One Christmas she worked at Sears in the gift-wrapping department. Even before reading the cards, her family can still tell if Helene wrapped their gifts. During the summers while in college, Helene did temp work for doctors so their regular staff could take vacation time. Her first job out of college was the one that got away—working as a pass clerk at an airline out at Hobby Airport, but it did not last long and she moved on. Shortly afterward, Helene was hired by a workers’ comp insurance company as a Dictaphone operator, where she worked for two-and-a-half very long years transcribing recorded interviews between adjusters and longshoremen and taking arbitration board minutes by shorthand. One of the adjusters Helene worked with was attending law school at night. After passing the bar, he left to join a small law firm and asked Helene to go with him to be his secretary. Jumping from the frying pan into the fire, Helene agreed. After a couple of years, one of the attorneys left the firm to join a large downtown law firm and later called to tell her his new firm was hiring secretaries. Helene interviewed at Fulbright, Crooker, Freeman, Bates & Jaworski and was hired the same day. As they say, the rest is history. Helene began her career at Fulbright in May 1971. During the first few months there, she floated around the secretarial desks learning the firm and the attorneys. Her first permanent desk assignment was as secretary to the head partner of the firm’s real estate and oil and gas section, John M. Jamison, which lasted until his death on April 15, 1974. After that, she remained in the section assigned to other attorneys. When the new section head partner’s secretary turned in her notice, Helene applied for the position and began working for Uriel E. Dutton in 1976 and still works with him today. Helene has been my secretary, and invaluable assistant, for over 35 years. I have frequently said—and meant it—that if she ever retires I will change my non-retired “retirement” status to actual retirement. Helene is without doubt the most dedicated, diligent, and trustworthy legal secretary I have ever encountered. She is a true professional who devotes an incredible amount of time and energy to improving and expanding her skills. Any time our firm installs or considers installing a new program for our secretaries and staff to use, Helene is invariably among the small group selected to test the product. In addition to assisting me and other firm attorneys assigned to her, Helene spends a great deal of time assisting our firm’s management in all manner of confidential internal management functions as well as mentoring other firm secretaries. In short, she is the “go-to” person. What more can I say? In the summer of 1991, Helene and coworkers Dana West and Pam Tipton saw a want ad in the newspaper seeking someone to fill a secretarial position working for a top oil company executive who did a lot of traveling. Everyone started talking about “what if,” when they noticed the requirement that all applicants must hold a NALS Professional Legal Secretary certification. None of them was a certified PLS. Later, a flyer came through the office mail to each of the attorneys addressed to “the secretary of” advertising a PLS certification study group being held locally. After talking it over with a coworker who was already certified and who recommended the course to the group, Helene and the other secretaries signed up for the study course and joined Greater Houston Legal Secretaries Association, which was sponsoring the course. Following the six-week course, they sat for the March exam being held at the University of Houston (proctored by Druann Wiley, PLS); unfortunately, not all passed. Nine members of the study group (Helene, Dana, and Pam included) flew to New Orleans where the exam was being administered in conjunction with the NALS national forum to retake the exam. Since money was tight at the time, they stayed at the conference hotel four and five to a room. New Orleans was breaking records with the weather that July and it was hotter than hot. Nonetheless, everyone had fun touring Bourbon Street the night after the exam and enjoyed beignets and coffee that Sunday morning at Café Du Monde in the French Quarter before they returned home. The best part of the trip was they passed the exam! Helene believes she has been very fortunate in her life and does not know which makes her happier: working in the legal field or working for Fulbright. Lucky for her, it is the same thing. Her boss of 35 years, Uriel E. Dutton, is a retired senior partner and general counsel for the firm. In December 2010, she was given an additional assignment and now works with Chief Information Officer Edie Dillon. During her time at the firm, Helene has also been fortunate to work closely with several of the firm’s other partners, including Charles W. Hall and Gibson Gayle, Jr. Her favorite area of law is oil and gas, but she does not do much of that anymore since Mr. Dutton’s work has evolved and they now do mostly contract work. In addition to working for Mr. Dutton and Ms. Dillon, Helene is also the administrative secretary to the Leon Jaworski Foundation and the M.D. Anderson Foundation. Mr. Gayle was fortunate to work with Helene as his assistant for several years during that time he was a board member of the M.D. Anderson Foundation and the Leon Jaworski Foundation and says both were fortunate to have Helene contribute expert and meaningful services to them. He wants NALS members to know he has never known a more remarkably talented or conscientious individual than Helene Wood in carrying out her assigned duties, no matter how complicated and time-consuming they have been and regardless of whatever time constraints may have been involved. He believes any law firm, or any other organization for that matter, would instantly and significantly improve itself by adding an individual as wonderful and outstanding as Helene Wood to its team. Shortly after joining NALS, Helene began chairing committees for her local chapter. Three years after joining, she was serving as an officer of her local chapter and was president of the largest chapter in her state in 1997-1998, only five years after becoming a member. In 1996, she began chairing state committees, and served as the Texas ALP president for 2005-2026. While serving as a state officer, she continued to serve as a chairman for her local chapter and began serving on the NALS Certifying Board. Any member who has done that knows what a time commitment is required. Helene chaired the NALS Certifying Board for 2006-2007, and the following year she was elected by the membership to serve as the NALS Certification Director. Helene’s many hours of service to the association have not gone unnoticed by her peers. She received Greater Houston LSA’s 1997-1998 Legal Secretary of the Year Award, Houston ALS’s 2000-2001 Mentor Award, and Houston ALP’s 2010-2011 Inspiration Award. Helene was the NALS Award of Excellence recipient for 2002. While many NALS presidents have themes, most of the themes have a quote to go along with them, but Helene’s theme this year does not have a quote. Her theme is an idea represented by keys and the opportunities those keys unlock. One of Helene’s keys is her mother, who has been an inspiration and role model for her wisdom, steadfastness, love, and dependability. Helene’s firm and the partners she has worked closely with were key to her involvement with NALS from the beginning and continue to be. She feels fortunate to have been in the right place at the right time and to know and work with such giving and caring people. Having the support of her firm and its current leadership means a lot to Helene and is key to a memorable year as NALS president. Certification is another key and the one that first opened the door to her membership in NALS. NALS membership has been key in Helene’s professional life to gaining a sense of accomplishment and self-confidence. It has also been a key in making many friends across all levels of our association. If not for Helene’s NALS key, she would not have known the importance of certification and she would not have had the honor of being president of both her local chapter and state association. If not for NALS and its members, she would not now be the 42nd president of NALS. Helene has many mentors that have been key at different points in her professional life, such as Rita Alesi, Sharon Arway, David DeFranco, Joyce Look, Betty Wells, Leslie Stokes, and Patti Infanti. Another key, perhaps the one we owe the most thanks to, was Vickey Lee, a past Texas president, who approached Helene after a state installation and suggested that she consider running for office. Although she has not seen Vickey since, she did take her advice. The most significant people in Helene’s life right now are her family, both human and the furry kind. Helene lives with five indoor cats, an inside/outside cat, a temporary cat, many outside cats, various other wild critters, her sister Gwen, and her Yorkie who is a big clown. She knows all the animals are a bit much, but she loves them all, and, from time to time, she does find new homes for some of them. Thanks to Gwen, who takes care of the animals when Helene is out of town, Helene is able to travel with NALS. In addition to her 80-plus- year-old role model mom and stepfather, who are still going strong, and her sister Gwen, she has two other sisters, Carol Sue and Anne Janine, several nieces and nephews, and several great nieces and great nephews (all within shouting distance). Kip Hall, ALS, of Houston ALP remembers Helene as one of the first legal assistants she met after becoming a member of HALP. Helene quickly became, and continues to be, Kip’s mentor. Kip is witness to Helene’s active involvement in every aspect of our tri-level association. Marketing, membership, and certification are among Helene’s top priorities. During Kip’s year as HALP’s president, Helene was her number one “go-to” member and was always available to answer questions or give advice. Warm, approachable, and quick to recognize the accomplishments of others, her dedication and enthusiasm are a constant source of motivation. Helene’s leadership inspires Kip to seek ways to grow professionally and personally. Proud to call her a friend, Kip knows Helene will make a fabulous NALS president. When Helene is not serving the members of NALS, you can find her in her garden—or what is left of it after the Texas drought this past year. She also reads, but seldom one book at a time. She is reading three books right now and has another in waiting. She plays the piano, not well, but with enthusiasm. She also communes with her cats and visits family. An infrequent hobby, she loves visiting Italy (by way of Paris, of course). She likes most things about Italy—renaissance art, the landscape, the food, and the people. An art major in high school and college, she learned to love the Renaissance art and artists. Italy was the perfect place to go to see the original statues, buildings, and art. On her first trip she traveled with a family friend who had been before. They flew into Paris, took a train to Florence, Rome, Naples, and then flew back to Paris to tour the environs before heading home. Next up on her bucket list is her third trip to Italy. The best advice Helene ever received was “do not give up.” She shares that same advice with members who run for office and are not elected. She encourages them to try again, keep a smile on their face, and a good attitude in their heart. If being elected came easily, it would not be as worthwhile. Helene believes a positive attitude is the only way to go and that life is too much fun to waste it on being negative. She can be relied on by her coworkers, NALS members, family, and friends and is only a phone call or email away at any time. She loves life and has a goal to live it in good health to 119 years of age. On the rare occasion when she is feeling down, and, depending on what has her in that mood, she either talks to her mother or to her best friend, Rita Alesi. She confesses to reaching a point of burnout only once or twice, but she slept on it and got over it. The things she says she does not want to live without are her cats, chocolate, and coffee. Her guilty pleasure is the time she spends on NALS-related projects. Although Helene will admit to a partiality for certification, her real passion is with the members and working to see that they receive the best that NALS can offer. The only things that truly scare her are failure and, despite Donna Dendy’s excellent tutoring, public speaking. Many of us know Helene personally and have had the privilege of working with and learning from her. 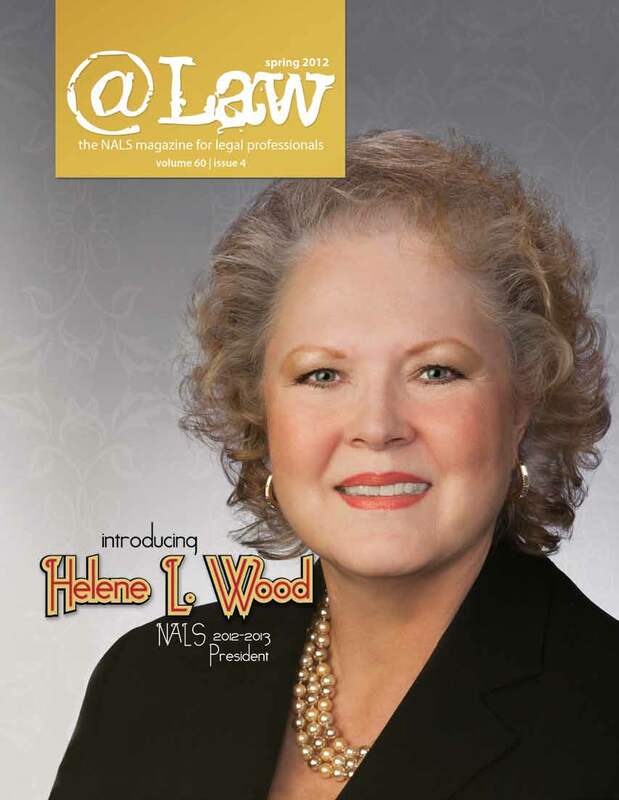 This year, Helene L. Wood will be the NALS “go-to” person. Her commitment will be “top notch” and her dedication will be “the best.” Helene L. Wood, the keeper of the keys. What more can I say? This article was originally published in @Law, the NALS magazine for legal professionals.